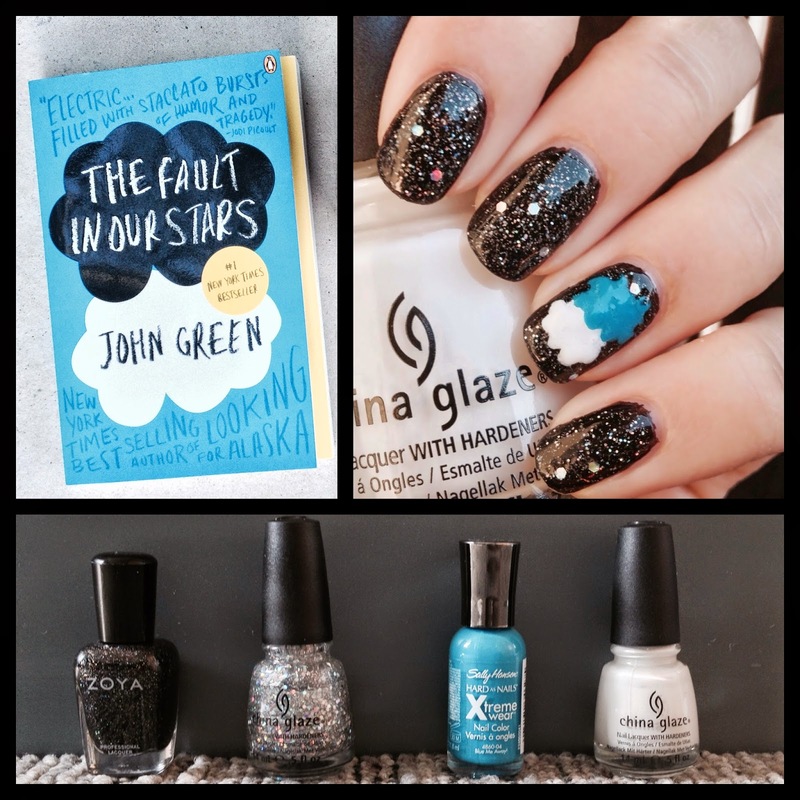 What I Blog About When I Blog About Books: Celebratory 'The Fault In Our Stars' Nail Art! 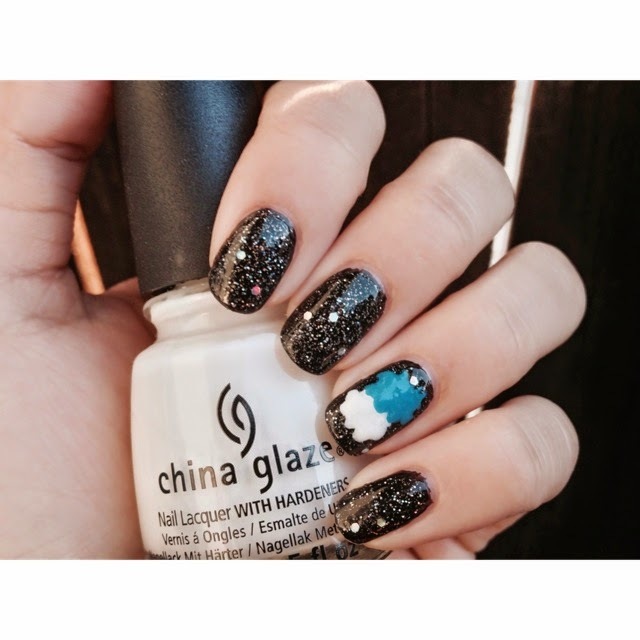 In celebration of the theatrical release of The Fault In Our Stars I decided to revamp the nail art design I did lo so many years ago (actually, it was just 1-2 years). This time, the design, though very much like the previous ones (which you can find here and here), is much more glittery, with a backdrop that is meant to resemble the starry night sky. Anyway, I hope you enjoy this nail art look. I am always surprised by how difficult it is to create clouds, despite their existence as non-specifically lumpy blobs. And before I jump right in, I wanted to mention that I'll be attending The Night Before Our Stars tonight! I can't wait and have been feeling nervous/anxious all week. 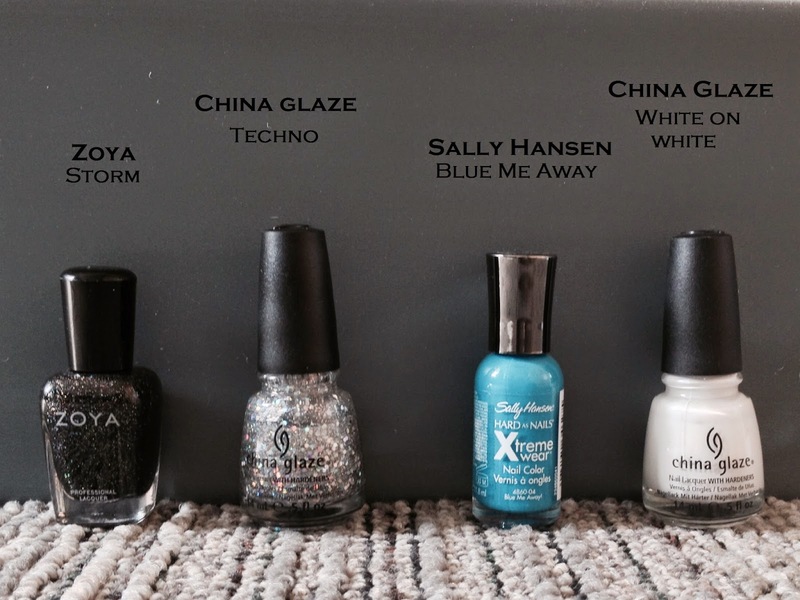 Okay, time for the nail art! The black polish I used (Zoya 'Storm') has small holographic glitters in it and is a completely beautiful polish alone. But for this look I added a coat of chunky holographic glitter (China Glaze 'Techno') for some extra shine. The glitters don't have to be holographic for either, but I think it looks especially nice this way. 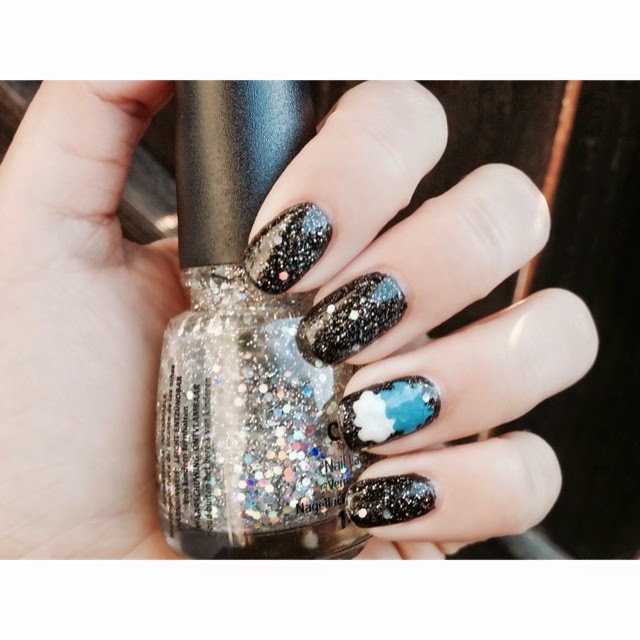 And here is the nail look! I really like this one. The chunky holographic glitter makes it perfect. And if you're going to see The Fault In Our Stars tonight or this weekend (or anytime really) don't forget to bring some tissues. Your nails always look perfect! Are they natural? And do you have a pic without any polish? this is adorable!! we love the book, and we love john green as a writer, so we'll have to try this out!